Between San Antonio and El Paso, about 100 miles north of the Texas-Mexico border, you'll come across the small town of Ozona, Texas. Named for the big open skies that stretch as far as the eye can see, Ozona is home to history, hospitality and great food. Jump off the interstate at Exit 365 and relax a while. Once you've made it off the main road be sure to stop by the regional Visitor's Center. The Ozona Visitor's Center is a place to stretch your legs, grab lodging, dining, and local services information as well as browse through brochures on communities and activities within 300 miles of Ozona. Right across the parking area, you can take a stroll through the Crockett County Interpretive Trail. 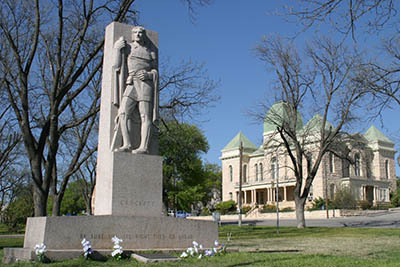 You are also just minutes away from the Davy Crockett Monument, the Emerald House, the Crockett County Museum, the Ozona Historic Town Square and a slew of other fun adventures. Ozona is in the center of the area attractions and can be used as a home base to explore many nearby sites, such as the Sonora Caverns, the Seminole Canyon State Park & Historic Site, or the Pecos River High Bridge. Just down the road from Ozona is the Fort Lancaster State Historic Site. Fort Lancaster is one of four posts established in 1855 to protect the military route between San Antonio and El Paso. Spend an afternoon wandering through the scenic ruins which still stand guard over the Pecos River Valley. If it's food you're looking for Ozona hits the spot. Dig into a nice juicy steak, enjoy some good ole home style cooking, or savor authentic Mexican food at the many restaurants of Ozona. If you're planning to visit the area "Hang Your Hat in History” and stay awhile! Crockett County is home to the Escondido Draw Recreational Area, a 3,400 acre park. The park is open to all-terrain vehicles and includes a 35+ mile single track trail for dirt bikes and 23+ miles of scenic trails and challenging hills for ATVs and OHVs. "The Tie That Binds" is a memorial to the pioneer families that came to settle this land and to those who followed. It signifies the work, the determination, and the hardships endured by our ancestors. The 82-acre park was originally donated to Crockett County in 1965 by the Meadows and Benckenstein families for preservation and public use of the site and was transferred to the Texas Parks and Wildlife Department in 1968. Today it is managed by the Texas Historical Commission.